Clothing Accessories There are 18 products. 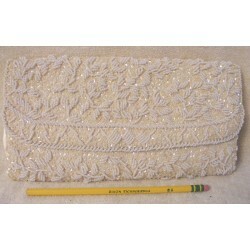 Here is a very nice evening bag! Comes with an 11in. 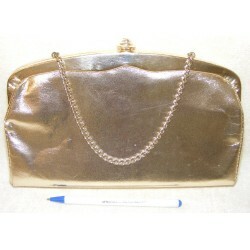 (27.9cm) chain attached by hinges Can be flipped to the inside to be used like a clutch style purse. Made of a shiny gold material made to look like leather. Interior gold colored lining. No markings as to the maker. 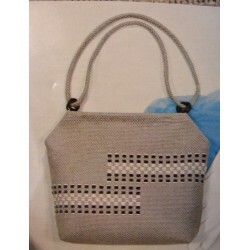 Here is a lovely handbag from Mantessa, handmade in Hong Kong. Mantessa was a trademark of Allied Stores in the 1970's. It has a snap closure. There is even a small pocket on the inside for little goodies. 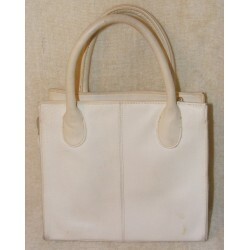 Here is a very nice handbag to add to your wardrobe! Fun and unique vintage styling, not a reproduction but the real thing. The inside has a pocket on each of the two lengthwise sides. One of those sides also has a zippered compartment. 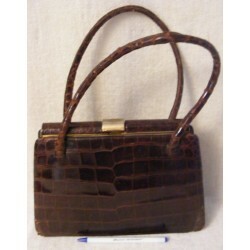 This fun and functional purse by Rosenfeld, was made in Italy. 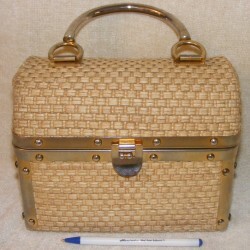 Has a very nice woven fabric exterior with loads of gold metal accents. Looks very much like a treasure chest to hold your treasures in. Fun and sparkly! Made by Isabelle Fiore. 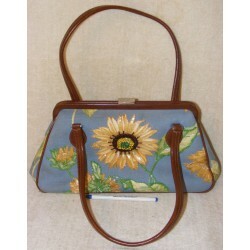 Blue canvas with yellow floral and sunflower print. 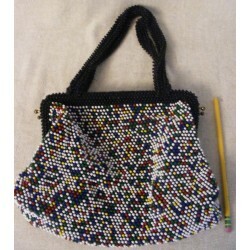 The flowers on one side of the purse is full of sparkling beads and sequins - especially the large sunflower which has a large, beaded center. Classic and fun altogether in one purse! Dark black, patent leather to go with many different outfits too. 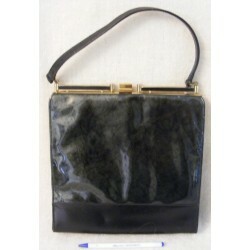 The front of this handbag has a large panel of black and silvery black design behind a clear plastic. Nice gold and black enamel metal frame and closure at the top. Here is a really cute, little bag. 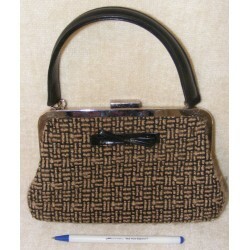 Black with a light brown patterned fabric. Even a little bow on the front for decoration. Interior is nice and clean with a small zippered compartment. All black, frilly lace apron with cotton waistband and tie. Authentic vintage. 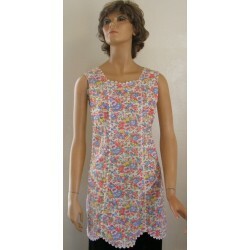 The pretty lace has a nice floral pattern. Longer, it reaches to about the calf. You can wear this vintage apron for entertaining and special occasions. 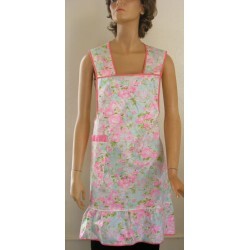 Formal, fun and pretty to wear, this is a very nice apron to add to any ladies wardrobe or collection! 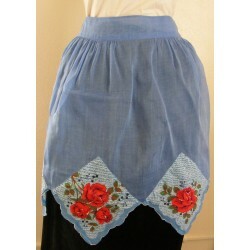 The handkerchiefs on this blue, vintage apron have bright red roses on them. The roses really pop! 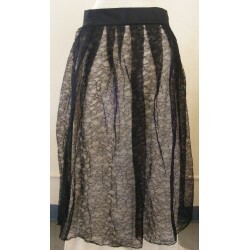 Light and airy, the organza fabric is very nice to wear for entertaining or just for fun. This pretty apron is sure to be a welcome addition to your wardrobe, collection and particularly in your kitchen! 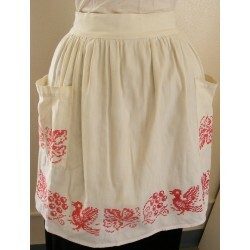 Cute, authentic retro apron with red cross stitch pattern. Has red, 3 inch cross stitch bird, floral and berry pattern around the hem. Each of the 2 pockets also have cross stitching on them. Heavier weight, broadcloth fabric makes this vintage apron perfect for cooking and wearing in the kitchen! 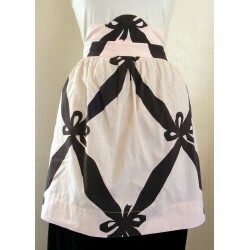 This retro apron has a pink and black design. Cotton, light pink fabric with black and geometric and bow pattern on it. Scallops on the waistband in the front is a nice touch. Very wearable and functional for cooking and use in the kitchen. This is a nice, authentic retro apron for sale! Sweet half apron of sheer net material. Beads and star and a few moon sequins add sparkle to this hostess apron. Very sheer. 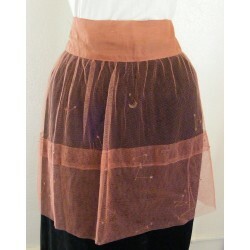 Sheer brown fabric for the waistband and tie. 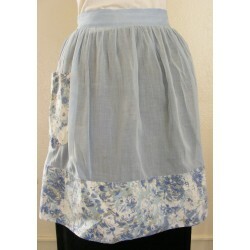 This half apron is fun to wear and great for entertaining!